In early June, Boatdealers.ca joined other Canadian boating journalists at luxurious Deerhurst Resort on Peninsula Lake just outside Huntsville, Ontario, the site of the highly publicized and perhaps controversial G-8 economic summit three years ago, for a tech-talk and water testing session prior to the arrival of Yamaha Canada’s dealer network. One of the highlights of our water test session, and perhaps the most sought after boat was Yamaha’s newest jet-powered offering, the AR192 Sportboat. A word of model clarification is probably in order at this point. Yamaha offers twelve models of jet-powered, or more specifically what Yamaha refers to as its Internal Propulsion System, boats for 2013 in three sizes – nineteen, twenty-one, and almost twenty-four feet. The two larger sizes are twin-engine powered while the four nineteen-foot models are powered by single engines. These four nineteen-foot models (nineteen feet, two inches to be precise) are the AR192 subject of this review, the SX192, AR190, and SX190. All four have physically identical hulls. 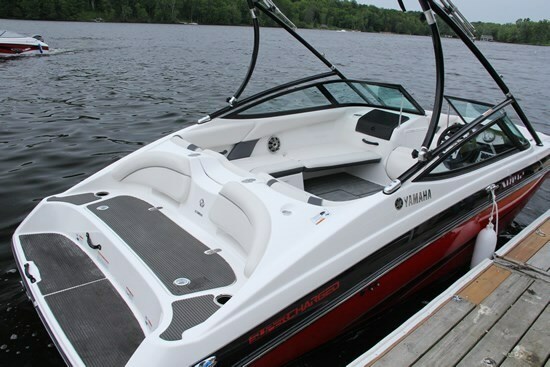 The two “AR” models have a folding aluminum black powder coated wakeboard tower with bimini top as standard equipment whereas the two “SX” models have only the bimini top and no tower. Other minor interior differences will be noted later on. Further, the difference between the “190” and “192” versions rests solely with the engine power. 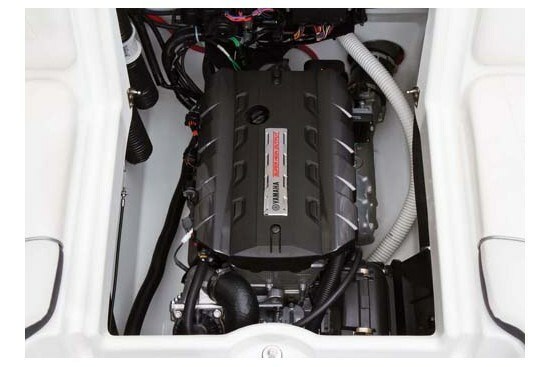 Both have Yamaha’s own 1.8-litre four-stroke ultra-low emission rated Marine engine, but the model “190” is naturally aspirated whereas the new “192” is supercharged and produces more horsepower. How much more, Yamaha won’t say, as it does not publish horsepower figures for any of its jet boats, but enough more that the difference in performance, especially in hole-shot, between the 190 and 192 is noticeable and remarkable. 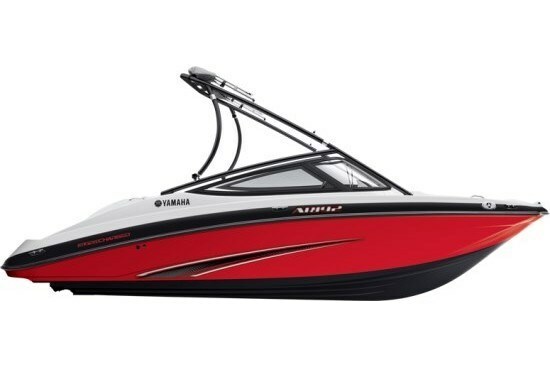 So now you know that the AR192 we water tested that rather dreary, overcast day in Muskoka had the standard wakeboard tower and the supercharged engine, and just for the record, had the red hull colour option, one of two choices, the other colour choice being black. Let’s get right to the point. If you want an extreme adrenalin rush, simply find a clear stretch of water, ensure that the steering is pointed straight ahead and the safety engine-kill lanyard is attached to you (as it should be along with the wearing of PFD’s at all times in any small open or performance boat), let any passengers know what you are about to do so they can be prepared to hang on, and then gently and firmly push the throttle full forward. The resulting thrust and g-forces will pin you right back in the well padded and comfortable driver’s seat as you instantly plane out and quickly throttle back to catch up with yourself and the goings on around you. The hardest thing will be to wipe that smile off your face and try to stop giggling to yourself. What a thrill, sheer excitement and exhilaration this boat offers. Yamaha claims less than six seconds from stop to 30 mph and this is totally believable. Yamaha also claims about 48 mph top speed for this supercharged 192 version compared to about 42 to 43 mph top speed for the naturally aspirated 190 version, but the difference seems even more pronounced, and especially in acceleration between the two. In what Yamaha calls this Super High Output supercharged 192 model, our own tests that day with two adults aboard and with about three-quarters showing on the fuel gauge, we achieved a top speed of exactly 50 mph (using GPS) at 7500 RPM on this high-revving, sweet sounding engine. Our other results produced 21 mph at 5000 RPM, 29 mph at 6000, and 43 mph at 7000. 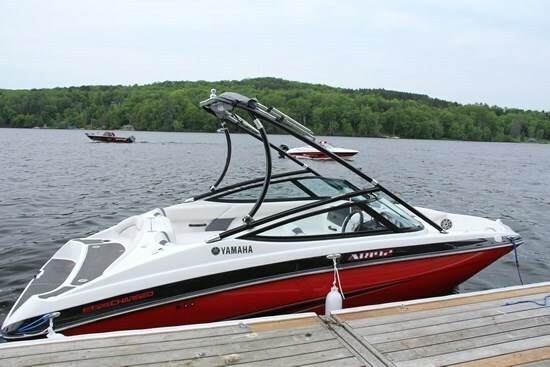 Our “AR” version, remember, with the standard wakeboard tower, has a single adjustable captain’s chair with flip-up bolster plus a J-shaped lounge seat right from the passenger dash along the port side and across the transom. The “SX” version without the tower has two captain’s chairs plus a U-shaped rear lounge. But this new supercharged 192 series comes with other standard amenities to make it stand out from its naturally aspirated 190 series siblings. 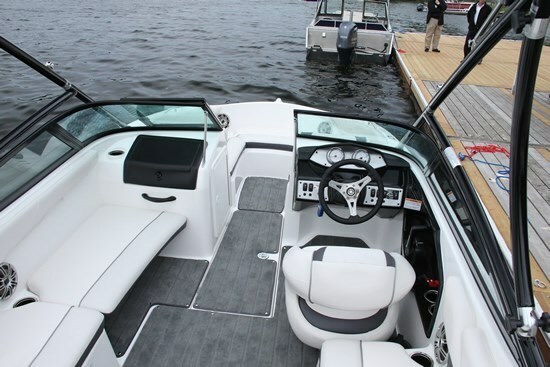 These features include premium snap-in cockpit carpeting, bow filler insert cushions, stainless steel cupholders (9 in all), an integrated removable cooler chest stored under the lounge seat, premium stereo speakers, an in-dash depth finder, stainless steel rub rails, and pop-up cleats. Other standard features include lots of usable storage under-seat, in-floor, and within the consoles, U-shaped bow seating with backrests, dedicated bow anchor storage locker, an AM/FM Clarion stereo with MP3 input located within the deep and usable glove box, tilt steering, plus a custom single axle painted trailer with disc brakes and swing-away tongue. Saving perhaps the best to the last, most notable standard features include a two-tier swim platform covered with Hydro-Turf® mats and with the lower section positioned just off the water and complete with an underside-mounted stainless steel, telescoping boarding ladder and with the upper section containing a wet storage compartment and an access port providing quick and easy inspection and cleaning access to the direct-drive jet drive. 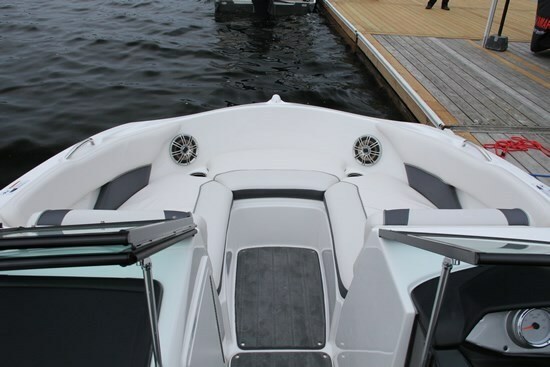 Also notable is the standard 3-position No Wake Mode™ control plus Cruise Assist control at the helm. 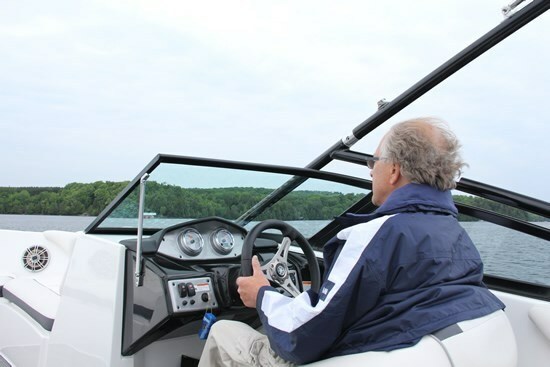 Finally, for an additional adrenaline rush, and only if you’re an experienced driver and at no more than half-throttle, try cranking the steering alternately lock-to-lock and experience the phenomenal turn-on-a-dime capabilities of this fun to drive boat. Your smile will say it all.